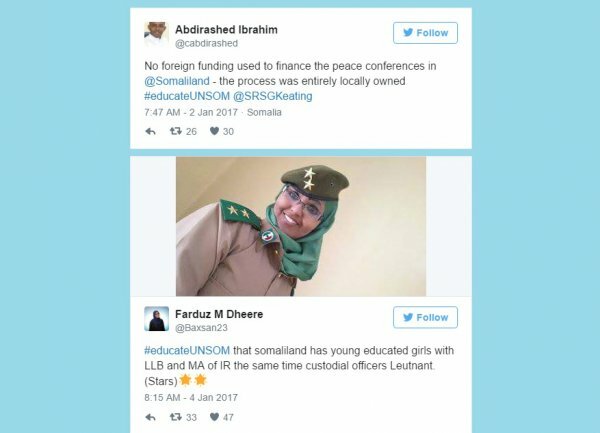 In December 2016, Somalilanders initiated a Twitter campaign to vent their frustration about tweets from the United Nations Assistance Mission in Somalia (UNSOM). UNSOM tweeted about Somaliland’s participation in Somalia’s election, which led many Somalilanders to post about the differences between Somaliland and Somalia, as well as the former’s achievements over the latter, using the hashtag #educate UNSOM. Somaliland declared its independence from Somalia in 1991 and now wants to be recognized as a sovereign State by the UN. In its quest to inform and support the electoral process in Somalia, the United Nations Assistance Mission in Somalia (UNSOM) stepped on the wrong foot of the people of self-declared independent Somaliland on Twitter and in press statements. UNSOM’s offence was tweeting and releasing statements about Somaliland’s participation in Somalia’s election, which was indeed the case as some candidates “representing” Somaliland were voted into the parliament in Mogadishu. Examples of the tweets are: “3 women elected today 2 seats in House of People from #Somaliland, 10 of 26 #Somaliland MPs-elect are female for 38% share of seats so far”, and “Elections for MPs representing Somaliland community to resume soon. delegates occupy their seats. #SIEIT on its final Pre #Doorashada2016”. The people of Somaliland expressed their displeasure using the hashtag #educateUNSOM to tweet about the difference between Somalia and Somaliland as well as the achievements of the latter over the former. The campaign started since December  and it is trending in Somalia and other neighbouring countries.